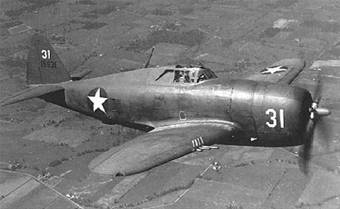 On January 14, 1943, two P-47B fighter aircraft were over Westover Filed when they were involved in a mid-air collision. One aircraft, (Ser. No. 41-6005), piloted by 1st Lieutenant Joseph H. Freeman, Jr., of Weatherford, Texas, crashed and burned, killing Lt. Freeman. The other aircraft, (Ser. No. 41-6002), suffered little damage and landed safely. Both aircraft were part of the 340th Fighter Squadron, 348th Fighter Group, then stationed at Westover. Lt. Freeman is buried in City Greenwood Cemetery in Weatherford, Texas. To see a photo of his grave go to www.findagrave.com. One will note that he was born on January 14, 1920, and died on his 23rd birthday. The aircraft involved in this accident which landed safely, (41-6002), crashed and burned in West Greenwich, Rhode Island, on March 24, 1943. The pilot did not survive. The details of that accident are posted elsewhere on this website.